Singer Tom Pickle (Michael York) goes to India to learn the sitar from a guru (Utpal Dutt). Also there is Jenny (Rita Tushingham with garishly made-up eyes) who cares more about the guru than the sitar. Eventually they go to the holy city of Benares to see the guru's guru, which changes both of them. This was actually an early Merchant/Ivory movie distributed in the States by Fox and the print I saw was off FXM. It was 4:3, but I don't what ratio it was panned-and-scanned from since the movie was filmed in India, presumably with blocked funds like Merchant/Ivory's earlier works. (IMDb doesn't list an aspect ratio for this one.) The story isn't much, but the location shooting and the look at the time in which the movie was made are mildly interesting. 5/10, with the fifth point for the location shooting. British WWII prison movie from director Guy Hamilton. 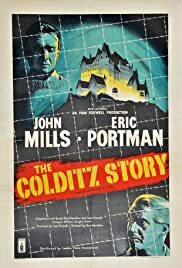 John Mills and Eric Portman star as British officers imprisoned by the Germans at Colditz Castle, a reportedly inescapable facility designed for the most incorrigible P.O.W.'s. That doesn't stop the multi-national prisoners from attempting escape attempt after escape attempt, though. Also featuring Bryan Forbes, Lionel Jeffries, Christopher Rhodes, Ian Carmichael, Frederick Valk, Anton Diffring, and Theodore Bikel. Sharp, no-frills drama with a good performance from Portman. 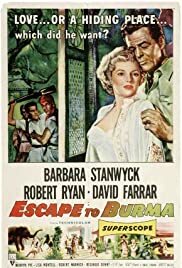 Silly exotic-locale melodrama with Robert Ryan accused of murdering a nobleman's son. 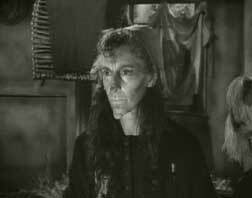 He hides out on the plantation of Barbara Stanwyck, who is revered by the natives as an almost supernatural personage due to her expert handling of elephants. Babs quickly falls for Bob, but cop David Farrar shows up and ruins everything. Also featuring Reginald Denny, Robert Warwick, Robert Cabal, Peter Coe, and Gavin Muir. Technicolor jungle nonsense. Prime late-period Joan Crawford melodrama. 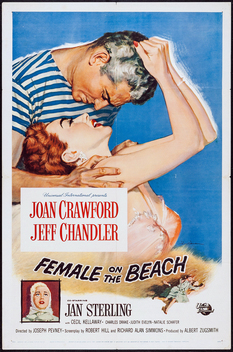 Joan plays a bitter, middle-aged single lady who arrives to take up residence in a swanky beach house. She meets hunky Jeff Chandler and, despite her better judgment, slowly falls for him. But his motives may not be pure, and the last woman who loved him "fell" to her death. Also featuring Jan Sterling, Charles Drake, Cecil Kellaway, Natalie Schafer, Stuart Randall, Marjorie Bennett, and Ed Fury. The B&W cinematography by Charles Land is very good, and the performances are pitched at just the right level for the material. You gotta love this poster. Joan has that "Kiss me right now, you big lug, or I'll pull out all of your hair" look. That's sort of up to you, it sort of presages our current state of affairs, and that makes it interesting. The Steampunk-ers would love it. I always feel sorry for him, an attractive, masculine screen presence and a reasonably big star at Universal during the '50s but cast in a lot of ordinary features, few, if any of them particularly worthy of mention today. Perhaps remembered as Cochise in Broken Arrow more than any other film. And a victim of medical malpractice at such a young age - 42. I saw the Japanese remake (1964). Unforgettable, Natalie Schafer and Cecil Kellaway were pimps for Jeff Chandler. Well, he did have a lot to offer. And their former boytoy was Ed Fury. Humorously bad crime drama with Frank Lovejoy as a "four-time loser" who the Treasury Department invites to work as an undercover agent. They want to take down big-time gangster Forrest Tucker, but can't pin anything on him that will stick, so Lovejoy has to help catch Tucker in the act. Also featuring Peggie Castle as Lovejoy's girl, Timothy Carey as Tucker's chief heavy, John Cliff, Hugh Sanders, Dorothy Green, Joi Lansing, Henry Kulky, and Lisa Montell. Lovejoy narrates using a lot of hard-boiled dialogue. He also fights most every other guy on screen, despite being half their size. Everyone wears really big overcoats, too. Timothy Carey is his usual delightful self, and almost makes this programmer worth while. Then again, based on the title, I was hoping this was a superhero movie, like Doctor Digit or Captain Phalanges. 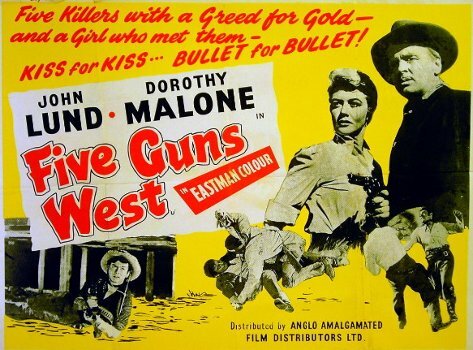 Low-budget western that marked the directing debut of Roger Corman. Five condemned prisoners (John Lund, Mike "Touch" Connors, Paul Birch, W. Robert Campbell, and Jonathan Haze) are granted clemency in exchange for undertaking a perilous mission to intercept a Union gold shipment. The unscrupulous bunch hide out at the home of Dorothy Malone and her elderly uncle, and they spend their time waiting for action by bickering and fighting with each other. Also featuring Jack Ingram, James Stone, Larry Thor, and James B. Sikking. Of minor historical note but it makes for pretty poor entertainment. I've seen some of his films, and he sounds like Cochise in every one of them. I enjoyed it when Lovejoy beat up on Carey (ten times his size) and Carey screamed like a chicken. I've had that one lined up to watch when I get to '57 in a couple of weeks or so. It looks promising. You might want to jump ahead a couple of years, Lawrence. The weirdest thing about this film (and there is a lot to choose from) is that the opening music is from On The Waterfront. Elmer Bernstein probably told the producers they could have it free as long as he got to meet Anita. Well, that's the kind of randy guy Elmer was, I guess. Forget ownership rights. He'd have told them they could have Beethoven's 9th, too, if it got him a date with Anita. Could you list what movies those pics are from? I want to look them up and make sure I have them available if I haven't seen them yet.